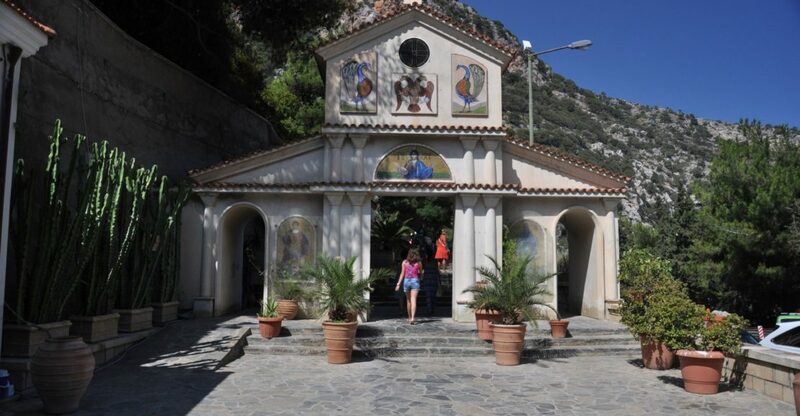 Saint George Selinaris or Agios Georgios Selinaris is located on the road to Agios Nikolaos from Heraklion. There is a small 16th century church, and a monastery which was added on much later. Many travellers passing by stop to light a candle in the church, then combine their religious repast with a gastronomic delight. The surrounding cantinas are famous for their souvlakis. Tradition says that if someone passes Agios Georgios Selinaris without at least crossing one’s self, the culprit’s car may very well come to a stop down the road with a sudden and mysterious mechanical malfunction! Also, with the numerous bird species that nest in the broader areahere, visitors have a good chance of observing the many hawks and vultures hovering around.